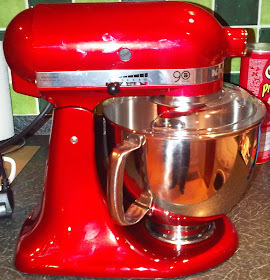 Just a Girl and her KitchenAid: Lemon Cupcakes and an Introduction to The Caked Crusader! Lemon Cupcakes and an Introduction to The Caked Crusader! So, here's the story. Every summer I go to Waterstones before my holidays and invest in more books than I can justify. This year, my books took the theme of baking (who'd have thought it!) and among the others was Meet Me at The Cupcake Cafe by Jenny Colgan. Firstly, this book was truly lovely and I can fully recommend it- warning though, it made me want to open my own cafe, so beware! Secondly, this book introduced me to The Caked Crusader and so the challenge begins as I attempt all of her mouth wateringly fantastic cakes. I can't stress enough how much everyone needs to read her blog and try out her recipes- http://thecakedcrusader.blogspot.com/- go bake!! This was the first of The Caked Crusader's recipes that I tried and also the first time that I had ever made Swiss Meringue Buttercream. I can safely say that I- or if I were cruel enough to drag my brother into this, we- failed miserably in terms of the buttercream! The cupcakes were moist, with a crunchy layer of lemon syrup over the top of them, a result of brushing the left over lemon juice over the cupcakes as soon as they came out of the oven. I used the same method when making my Lemon Drizzle Cake and knew it was a winning idea as soon as I read the recipe. Despite the fact that my brother and I were both in agreement with The Caked Crusader in her dislike of having rind in a cake, we decided to continue with the recipe and put the rind in the mixture. This provided great flavour but unfortunately the texture just wasn't right for us and we'll know not to do the same again next time! Unfortunately, as I say, we were unsuccessful in making our Swiss Meringue Buttercream. Our buttercream came out almost like the cream that comes out of a can and had the most undesirable texture. This annoyed me hugely as I knew how lovely the cakes were supposed to be. I eventually asked The Caked Crusader for her help and she suggested that the sugar hadn't dissolved properly and that we were to continue to whisk until the buttercream was smooth and creamy. I think in our haste to have our cupcakes, we skimped on time to allow the sugar to dissolve and were to quick to stop the buttercream from reaching it's potential, leaving us with our disappointing result! All in all, fabulous cupcakes with a beautiful icing, we just cocked it up somewhat! Line a muffin pan with 12 paper cases. Start by making the cupcakes. Beat together the butter and sugar until pale and fluffy. Add the eggs, flour, lemon rind and half the lemon juice. If necessary (this will depend on the juiciness of your lemon), add a dash of milk and beat until well combined and smooth. You’re aiming for a nice light, almost dropping consistency batter. Spoon the mixture evenly into the 12 paper cases. Bake for approximately 15 minutes or until a skewer comes out clean. Mine took 17 minutes. 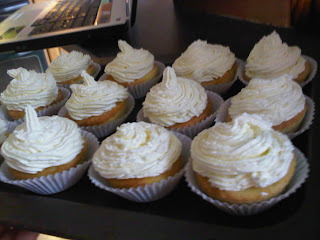 Remove from the oven and, straight away, brush the remaining lemon juice over the hot cupcakes. Now make the swiss meringue buttercream. Place the egg whites and sugar in a bowl over a pan of simmering water. Stir pretty much constantly to prevent the egg from cooking. After 5-10 minutes, when the sugar has dissolved, remove the bowl from the pan of simmering water and whisk until the meringue has puffed up and the mix is cool. Add the butter and lemon extract to the meringue and whisk until the butter has been completely incorporated into the meringue. At first it will look a disaster – it will collapse and look curdled but don’t worry! Stop when the mixture is smooth, light and fluffy. Spoon the buttercream into a piping bag and swirl onto each cupcake.